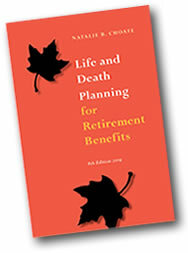 Natalie Choate’s classic book Life and Death Planning for Retirement Benefits, has been an indispensable reference for estate planners since 1996. The new EIGHTH EDITION of this classic book is now available and can be ordered using the form on this page or you can order online. If you prefer a digital version, you can subscribe to the electronic edition of the book. Subscription is $9/month cancellable at any time. Visit www.retirementbenefitsplanning.net to learn more about the ebook or subscribe. Everything you need to know about the required minimum distribution rules both during life and post-death (inherited plans and IRAs). See Chapter 1. Everything Roth: Roth conversions, 8 ways to contribute to a Roth IRA, Roth distributions, Roth rollovers, Roth abuses, and how the early-distributions penalty affects Roth plans. See Chapter 5. Rollovers and plan-to-plan transfers: What’s the difference, what are the requirements for (and effects of) each, and which should you use when. Chapter 2. After-tax money in plans and IRAs: How it gets into a plan or IRA and how to get it OUT of the plan or IRA tax-free via a distribution or Roth conversion. Chapter 2. Post-death planning and compliance in Chapter 4: The executor’s role (¶ 4.1), titling the inherited IRA (¶ 4.2.01), post-death rollovers and transfers (¶ 4.2), federal estate tax treatment of retirement benefits (¶ 4.3), double deaths (¶ 4.4.12), and cleanup strategies (¶ 4.5). Trusts as beneficiaries of retirement benefits in depth, including trust accounting for retirement benefits, the “minimum distribution trust rules,” fiduciary income tax treatment of retirement benefits, and discussion (with examples) of planning options to benefit the surviving spouse, minors, and a disabled beneficiary. Chapter 6. And more: Income tax treatment of distributions including LSD and NUA (Chapter 2), spousal rights, special spousal rules, and marital deduction issues (Chapter 3), qualified disclaimers (¶ 4.4), income in respect of a decedent (¶ 4.6), charitable giving with retirement benefits (Chapter 7), investors’ issues (fees, losses, “self-directed” IRAs, prohibited transactions, UBTI) and 10% penalty on pre-age-59½ distributions (Chapter 9). AS ALWAYS citations are provided for EVERY statement so you can verify this important information from original sources. participant, and guide retirees on their distribution choices. Checklists assist in drafting a beneficiary designation form or trust to be named as beneficiary of a retirement plan, and in using disclaimers.